“What makes a family?” is the question at the heart of We Are All Completely Beside Ourselves, a dark, compelling and often comical novel by Karen Joy Fowler Good author? Yes. She wrote The Jane Austen Book Club, which was well-reviewed (although it got so-so stars on Goodreads). And if you liked Fowler’s willingness to expose flaws in her characters in that book, you’ll adore Beside Ourselves. There isn’t a single character – including the protagonist, the sadly silent Rosemary Cooke – who isn’t a human mishmash of good, bad, and indifferent. And that includes her parents, her brother Lowell, and her estranged sister, Fern, who left the family when Rosemary was a young girl. The Cookes talk of her seldom, but her impact is felt by all. I’ll pause here to say that there is a secret at the heart of this novel and if you have been lucky enough NOT to know what happened to Fern, you should stop reading this review immediately. Stop now. Go get the book (download it with one-click purchasing on Amazon if you must), read it and come back. I’ll wait. There. You’ll agree with me that Rosemary Cooke is that most compelling of narrators: an unreliable one. We see the whole story from her perspective. The hearty psychologist father. The caring scientist mother. The sensitive older brother. The sister who depends on sign language – and chatterbox Rosemary – to communicate. The rotating cadre of smart and personable grad students who support the family in their quest to raise Rosemary and Fern as siblings. 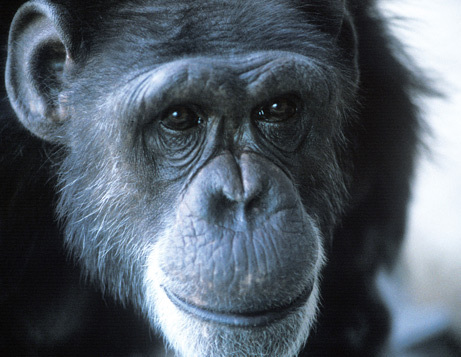 Fern, who happens to be a chimpanzee. Fern, who was sent away suddenly, for no reason that Rosemary remembers, but whatever it was, it tore the Cooke family apart. As Rosemary’s memory improves, the story takes on tragic proportions. 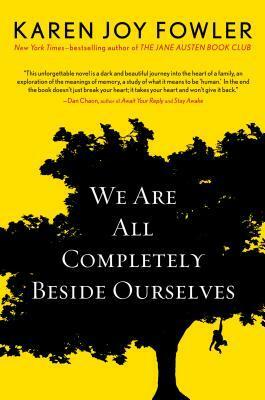 We Are All Completely Beside Ourselves is an amazing, imaginative book populated by real people, good-hearted, flawed and sad. Even Fern, who is introduced late in the novel as an actual character, not just a memory, is far from the idealized childhood sibling that Rosemary recalls early on. No one is without blame. Despite this, love lives on. This entry was posted in Commentary, Review and tagged Fern, Karen Joy Fowler, We are All Completely Beside Ourselves. Bookmark the permalink.